Dandy was our first foster dog. An elderly lady had found him and took him in. 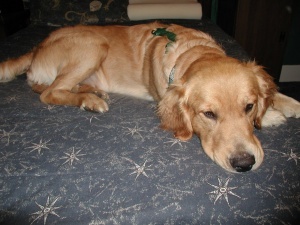 Sadly, Dandy was a big dog, and she could not care of him, so he was turned over to Golden Bond. We picked him up soon after he was neutered. We are not sure of his age, except that he had huge paws and his mid and rear sections were small. He was somewhere between 1-3 years old. He is a calm gentle dog. Mark called him a big Galoute. He had this tendency to melt on you when you petted him. He would literally fall down on you, almost knocking you over. He and Cinnamon played well together, except when he wanted to stop playing he would just stop, annoying our dog. We took him to the Golden Bond picnic. Several people were interested in him. 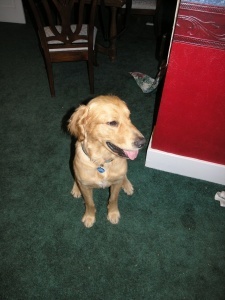 We found a wonderful family for him up in the Portland area. He now has a brother along with a family with 2 older girls and a young boy. They renamed him Kavanagh. 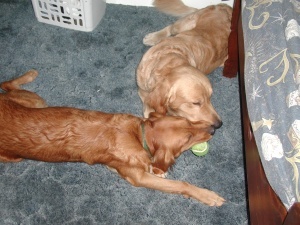 @ years later they had to surrender him as the 2 dogs really did not get along. But he did find a new furr-ever home after that.